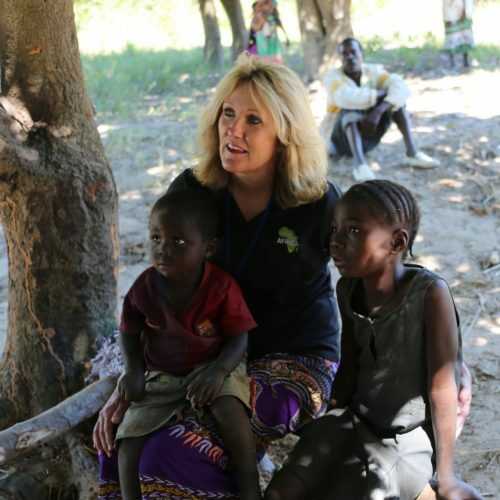 So many thoughts come to my mind when I think about our experiences in Zambia, Africa. We travelled 3 days, in our caravan of SUV’s, accompanying the Golf Fore Africa and World Vision entourage of angels. This small country in the continent of Africa seemed gigantic after driving for hours each day in vast lands, often on unpaved bumpy roads, passing village after village. Most of the villages are without any clean water. It was so primitive and like no other place we had ever been. But, these people were so amazing. They have nothing, but yet they seem to have everything. They sing and dance and nothing seems to break their spirit. The most precious thing that they DON’T have, is clean potable water. This is something that many of them don’t understand that they even need. But once clean water is accessible to a village, and the people are taught its importance, it changes their lives forever and they DO see its value. It took us four and a half hours to visit the village that enjoys the “well” my husband and I donated along with another good friend of ours. The people were so proud and grateful to have a water well, that they put on a “skit” for us, with costumes, telling their story of “what life was like before and then after they had clean water”. They truly understood what clean water has done for them and their health. What a great celebration! Along the roadsides, women and children can always be seen carrying things like fresh produce, wooden logs, and large buckets of water on their heads. The women are incredibly strong. They walk for miles every day seeking water, with their buckets on their heads and their babies on their backs or chests, in their homemade colorful, cloth slings. Not only is this a grinding physical task, but also, the women take risks beyond their anatomical abuses. The risks include being raped along their path, being eaten by crocodiles along the rivers, being crushed to death by the hippopotami, not to mention dying from the dirty water diseases. The differences in villages enjoying clean water, versus dirty water is very profound. When a village has clean water, businesses are born, independence & self-esteem is gained, health & hygiene improve, and the children go to school instead of walking all day in search of water. 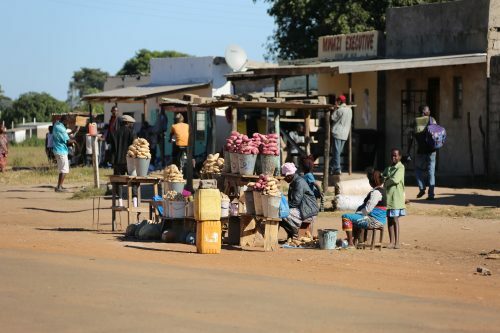 The women we met in one village, who started businesses, actually formed a “Village Bank”. Those who could, contributed to this bank which could then lend them additional money for personal needs or to grow their businesses even more. This resulted in responsible, proud and successful, productive human beings. They seemed to be glowing with happiness and gratitude, as they told us their uplifting stories. Experiencing this, was a big highlight of our trip! The most powerful memory that we both have, without a doubt, was meeting “Edith”. We got to visit her and her family at their home. Her village is currently without a water well. To see what living conditions are like without clean water, was unforgettable and definitely impactful. Edith is a fifty-five year old widow, who is “HIV Positive”, has lost 5 of her 6 children AND her husband to HIV, and now raises 4 young grandchildren as she struggles to survive. Her only living child is an eighteen year old son, who manages the cattle for the owner of the property in which they reside and earns “next to nothing” doing so. Edith appeared frail, weary, and did not smile, as she told us her story. Yet her strength was visible, in spite of the disease and her malnourished state. A week or two prior to our arrival, her youngest grandson had drowned in the water hole she frequents daily. This was the same water hole she led us to, where she showed us how she fetches her filthy drinking water. Miraculously, this precious child was resuscitated and did survive. He clung willingly to Debbie Quesada for our entire visit there. His audible, rattling chest when he breathed, and his noisy, congested cough, was evidence of his near-death experience. The “glazed over” look in his sad eyes and the lethargy in his body were tell-tale signs of his poor health and malnutrition. Heaven only knows what deadly parasites were now living in his lungs. And the sadness we felt for him was only magnified when he kept asking Debbie to take him home with her. He asked her several times, but none of us knew what he was saying, until a World Vision worker translated his repetitive request. For a child to beg a complete stranger to take him “away” from all that he’s ever known, indicates just how bad life must be there. As far as food for the family, Edith told us she can usually provide one meal a day, but sometimes….no meals at all. She tells us that she will always feed the children before herself. The consistent meal is, Manioc, which is a white root, also known to us as Yucca. It must be soaked, dried in the sun and then “ground” and sifted into a flour. They then boil it in water, like grits. It offers no taste or nutritional value, just simply a starch which fills their bellies. Edith was prepared to cook and serve us lunch, since it was that time of day. I guess she felt that it was the polite thing to do. Of course, we did not indulge in this for a number of reasons. But, it amazed me that she was willing to provide for us, when she struggles to provide for her own family! It was a very “touching” and genuine moment. When we met Edith, she had only been working with a World Vision case worker for five days. So, she was in the early process of learning “proper hygiene” and how to boil her drinking water, etc. 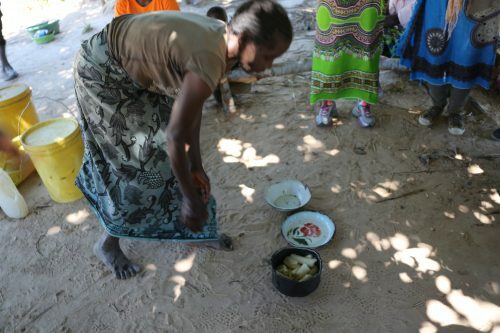 She had been shown how to wash her dishes with the boiled water and soap, and then letting them “air dry” high, OFF the ground. Ordinarily, she has allowed the chickens to walk all over her dishes lying on the floor and then she would eat from them. We saw blankets lying outside on the ground and over the bushes, instead of hanging on the clothesline that had also been provided for her. So, Edith has a lot to accept and to learn. As she tells us what her life is like each day, her young granddaughter lies in a nearby mud hut with a high fever, nausea and vomiting…probably Malaria or a gastrointestinal illness from all of the nasty parasites living in that water hole. Edith’s plan for that day, was to carry her granddaughter to the local clinic for treatment, and she must walk TWO hours to get there. All of the roads she must take are actually dirt paths with tall weeds growing in them. Edith and her bare feet are no strangers to these paths. My heart just ached for her and her family. Fortunately, World Vision was prepared to drive them to the clinic for medical treatment. I was particularly grateful and thanked God for this, especially being a nurse. To be so sick and to also raise four young children was more than I could ever imagine. But the good news is that there is a “pot of gold” at the end of the rainbow for Edith. She WILL have access to clean water soon. She and the rest of her village will have the help that they need, thanks to Golf Fore Africa, World Vision and the generous donors who make this possible. The future needs throughout Africa, are overwhelming and enormous. Thankfully, underground water IS there. But they can’t “get to it” without our help. Their country cannot solve this problem. And I cannot accept the fact that in the 21stCentury, there are still people without access to clean water. Most of us cannot even imagine what our lives would be like without running water in our sinks, showers, and toilets, let alone enjoying fresh water to drink. To be so blessed to have everything we need, makes me realize that we have an obligation to do whatever we can do to make a difference. One can’t help but to ask yourself, “Why was I one of the lucky ones, to be born HERE instead of THERE?” That could be me and my family in those horrendous conditions. The money I spend treating someone to a nice lunch “out”, could instead be donated to Golf Fore Africa and provide clean water to one person there, for their entire lifetime! Such a small sacrifice for almost anyone to make. My wish is, that many more people WILL take that step to truly change lives, whether it be a $50 donation, “sharing the cost” of a well, purchasing a hand pumped well or a mechanized well for a clinic.